Urban development in the Mediterranean has been very rapid. Of the 190 million people added to the population between 1970 and 2010, 163 million live in towns. Urban population (towns with more than 10.000 inhabitants) increased 1,9 % per year during that period, from 152 million to 315 million. The total could reach 385 million by 2025. More than 74 % of this growth took place in the south and east, where urban growth from 1970 to 2010 averaged 3,1 % a year, and about 4 % a year in Libya, Syria and Turkey. Urbanisation around the Mediterranean increased from 54 to 66 % over the same period. The south and east Mediterranean is urbanising more rapidly than the rest of the world. 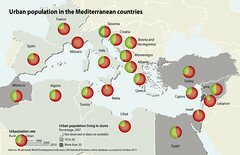 Projections indicate a drastic shift in the south and east Mediterranean. What were essentially rural countries, with an average urbanisation of 41 % in 1970, will become urban countries with 66 % urbanisation by 2025. (Plan Bleu computations based on UNDESA 2010). In coastal regions, where the urbanisation process results in over-development, the urban population could increase by 33 million (30 million of that increase in the south and east) between 2000 and 2025.